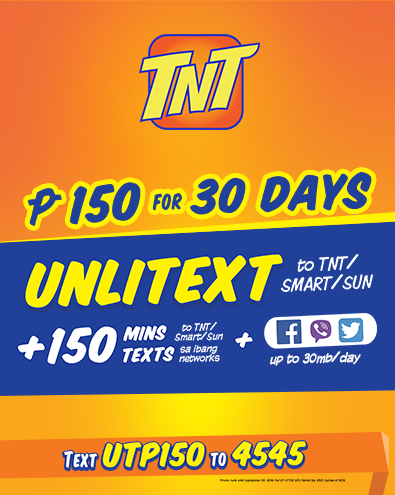 TP150 is a Talk N Text’s new promo code with 30 days unlimited texting and 150 minutes call to Sun Cellular, TNT and Smart network.You can also enjoy 150 free texts to all networks and you’ll also get 30MB per day of internet data consumable for 1 month when you use Facebook, Viber and Twitter application. NOTE: This promo is valid until September 30 2016, for updates you can visit TNT website and social media pages to inquiry. wala bang 150 for 30 days na pure unli call and text lang? wala n po bang free fb sa UTP150?